We had an amazing Trip to Uganda! We hope you can join us for a future EdVenture Trip with the Minnesota Zoo! For people interested in wildlife and passionate about conservation, travel to Africa is the ultimate adventure. Join the Minnesota Zoo and Wilderness Inquiry on this once-in-a-lifetime trip to Uganda. See chimpanzees, elephants, and lions in their wild habitats. Watch for hippos as you boat along the Kazinga Channel. Track wild gorillas on foot in Bwindi National Park. Our itinerary, customized for the Minnesota Zoo, is packed with activities, educational opportunities, and guided safaris with local rangers. Uganda, in East Africa, lies in the Nile Basin, in a varied, equatorial climate. Its diversity of ecosystems lends itself to a high diversity of animal species! Over 1,000 species of bird and over 350 mammal species live in Uganda, many in its more than 60 protected wildlife areas. During our ten days in-country, we’ll explore several national parks and visit forests, lakes, and rivers, as well as small cities and tea plantations. We’ll view wildlife from vehicles, from boats, and on foot, with expert local guides. With a small maximum group size, this trip offers you the optimal program to dive deep into a new understanding of Ugandan wildlife and conservation issues. Cost: $3,995 per person, plus round-trip airfare, baggage fees, and your Uganda visa. Solo Travelers: You will be paired with another traveler for hotel rooms. If you would prefer to have your own sleeping room for an additional $795 fee per person, please register normally online and then email Kristie Nord right after you register: [email protected]. Tell her you are requesting your own room and the additional fee will be added to your order. Deposit: A $500 deposit will be due at the time of registration. Final payments due by September 1, 2018. Accessibility and Experience: No previous experience is required. The activities within the program will require a moderate level of physical health and mobility. Some activities are more vigorous than others. Participants can typically choose alternative options for activities they don’t feel comfortable with or aren’t interested in. Flights: We will purchase flights as a group through the state travel agency once the trip is full, to ensure that everyone travels together on the same flights. The flight total will be added to your balance online. More Itinerary Information: Following is a list of just some of what we’ll do over the course of our adventure! Please email [email protected] if you have any questions about the itinerary or accommodations. You’ll meet your MN Zoo leader at the MSP Airport for travel to Uganda. Dec 27: Arrive in Uganda! Today the forest opens up for chimpanzee tracking. Kibale Forest is reputable for having the greatest variety and highest concentration of primates in East Africa. Enjoy a guided nature walk in this tropical rainforest. After lunch, travel to the Bigodi Swamp. The Bigodi Swamp Walk is an initiative of the local community and is known for its rich diversity of birds and primates. Dinner and overnight accommodations will be at Kibale Forest Camp. After breakfast travel to Queen Elizabeth National Park while passing the region of the Crater Lakes. Have lunch and later proceed on an evening game drive in search of warthogs, buffalo, waterbucks, and elephants. Dinner and overnight accommodations will be at Marafiki Safari Lodge. The day begins early for a morning game drive in Queen Elizabeth National Park. Search for lions, elephants, and buffalos in their natural habitat before returning for lunch. In the afternoon take the opportunity to relax on a luxury boat cruise along the Kazinga Channel, a natural channel between Lake Edward and Lake George. Abundant birdlife, elephants, buffalos, and hippos make their homes here. Dinner and overnight accommodations will be at Marafiki Safari Lodge. After breakfast head south, passing the southern sector of the Queen Elizabeth National Park. This part is called Ishasha and is famous for tree-climbing lions. After a short game drive continue to Bwindi National Park, home of the endangered mountain gorillas. Dinner and overnight accommodations will be at Gorilla Valley Lodge Lodge. Gorilla tracking–a meeting with the gentle giants of Bwindi National Park! Expect to walk in steep and muddy conditions, sometimes with rain overhead, before encountering any gorillas. 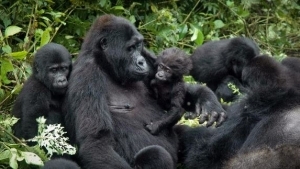 Once you meet with the mountain gorillas, you are allowed to spend one hour with them. Take as many pictures as you want and later return to the lodge. In the evening, you will visit the pygmies (Batwa) for another cultural adventure. Dinner and overnight accommodations will be at Gorilla Valley Lodge Lodge. After breakfast depart Bwindi and head to Lake Mburo National Park. Enjoy a boat ride on Lake Mburo to view the rich bird life and hippos. Tonight will be an early dinner to allow time for a night game drive in an open Land Cruiser. This special game drive provides an opportunity to see the elusive leopard. Overnight accommodations will be at Eagle’s Nest Lodge. Eat an early breakfast before a safari walk guided by a ranger. Lake Mburo is the only National Park where you can experience a safari on foot. Return to the lodge for lunch and in the afternoon, there will be time to visit shops or relax at the pool. Enjoy an evening game drive. Overnight accommodations will be at Eagle’s Nest Lodge. After breakfast, you will depart Lake Mburo and drive back to Kampala. Depending on your flight schedule you can join us on a Kampala city tour. You will be brought to Entebbe Airport in time for your flight.